DeFelsko Gage Positector 100, with Memory B probe. 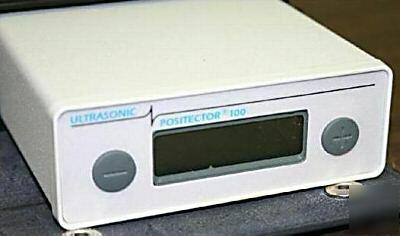 The Positector 100 uses an ultrasonic principle and advanced numerical techniques to properly measure single or multiple layer film thickness on plastics, concrete, wood, glass, ceramics and more. The instrument is easy to use with automatic calibration and operation, making it ideal for field and lab use. Adjusts to known coating and layer thickness; reset feature restores factory calibration settings; switchable measuring units in both English and metric; unique probe switch allows one hand operation. Three different series depending on the application; instruments are also available in either a standard or memory version. Series B is designed for measuring thin polymer coatings for applications such as paint on plastic, varnish on wood, etc. Comes with Positector 100, Probe "B", 6 x AAA batteries, software and operating instructions.